Delivery points, warehouses, bus stops, service centers or whatever they are, you can now map your business points on your Google Map using Sunrise Tracking. You can even set alerts to notify you when a vehicle enters or leaves a point. Add as much as POI’s as you wish to; no limits, all with Sunrise Tracking. Drop a pin on your desired location, name it and save it, easy & straight-forward. 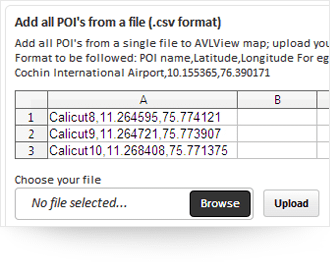 Got the latitude and longitude values of your desired Point of Interest? 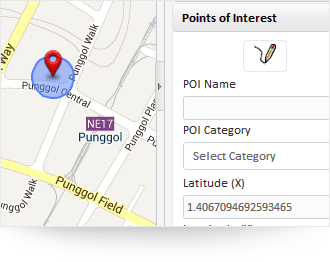 How easy the process is now, just enter the geographical co-ordinates and find the point/spot on map and add as POI. You do not know the exact geographical co-ordinates (latitude & longitude values) of the point you wish to create on map, nothing to be worried about, you can zoom into the specific location and mark a Point of Interest. Considering the margin of error that could occur by virtually placing a point on map, Sunrise Tracking offers a buffer value, say 100 m, which means 100 meters around the point you created will be considered as a single point, Depending on your location awareness, you can define the buffer from 10m -200m. Our licensed Google maps will suggest you the already saved points.